Clutter–physical and mental–can reduce our productivity and our quality of life. In this episode we consider some causes of clutter and a few thoughts about how to conquer it. My husband and I have been married for over 38 years and have raised five kids together. I'm a bookworm and a podcaster, and he's a gifted musician and a hobbyist handyman, all interests that come with plenty of “supplies” and equipment. We have a lot of stuff. Like most of you, I also have more than one role to fill in life. I’m a wife, a mom, a grandmother, a lawyer, a podcaster, a writer, a citizen, a friend, and a woman with various personal interests. I’m also a tech geek who spends a lot of time online. So I have a lot on my mind. Managing the physical and mental stuff filling my life is an ongoing project. From conversations I’ve had with other women, I know I’m not alone in this. Sometimes it can just be overwhelming. These facts have had me thinking about clutter and how it impacts my productivity and my ability not just to get the things done I need to, but also my ability to make a life that matters. I know that a lot of you are thinking about those things, too. It’s a good time to consider this if we hope to make 2018 even better than 2017. Clutter comes in many forms. An LA Times article tells us, “There are 300,000 items in the average American home.” An NPR article said that “The average size of the American home has nearly tripled in size over the past 50 years.” “And still, 1 out of every 10 Americans rent offsite storage—the fastest growing segment of the commercial real estate industry over the past four decades” (New York Times Magazine). We actually pay money to store stuff that doesn’t fit into our home. It’s interesting that we pay money to store things that we don’t use regularly. “While 25% of people with two-car garages don’t have room to park cars inside them and 32% only have room for one vehicle” (“21 Surprising Statistics that Reveal How Much Stuff We Actually Own,” by Joshua Becker). We have too much stuff in our heads. This is a result of too much information coming at us. We have 24-hour news, social media, and so many sources of information coming at us. Scott Eblin, the author of Overworked and Overwhelmed: The Mindfulness Alternative, has said, “Our constant mental chatter puts us in a constant state of fight or flight. This leads to bad decision-making, which impacts our health and well-being” (from “5 Routines to Clear Mental Clutter” by Stephanie Vozza). When we are constantly facing a barrage of information, noise, sounds, and screens, our instinctive fight-or-flight mechanisms make us less able to think clearly and make wise decisions. We think we'll need it someday. We might get a new set of pans, but we hang onto the old ones. Our brain resists letting go. A study at Yale School of Medicine disclosed that “two areas in your brain associated with pain, the anterior cingulate cortex and insula, light up in response to letting go of items you own and feel a connection towards. . . . Your brain views the loss of one of your valued possessions as the same as something that causes you physical pain.” (from “How Clutter Affects Your Productivity (and what to do about it)”) It almost literally hurts to give up possessions we feel an emotional connection to. Mental clutter has its own sources. We’re bombarded by information inputs and noise; it gets harder and harder to find or make time for quiet. We fill up our schedule and try to multi-task, bouncing our mind from task to talk. Booth warns this is a key reason not to check email first thing in the morning if you want to get work done on an important task that requires focus. If you look at email and you don’t deal with it all then part of your brain is stuck there, drawing your attention away from your important project. So many unproductive thoughts are in our head, such as worry, anxiety, and guilt. These clutter up our thoughts and keep us from seeing clearly. We addressed many of these in more depth in the Mindset Matters miniseries from episodes 108 (Productive Attitudes), 112 (Productive Beliefs), 114 (Productive Habits), and 115 (Productive Skills). Besides the expense (in both dollars and time), of maintaining and storing so much stuff and the time lost looking for things in all the clutter, the biggest negative impact of clutter might be the cost to our productivity. The physical clutter contributes to and exacerbates mental clutter. It creates a distraction and makes it hard to focus on important projects that need our focus. Those are the facts. We may think we do better in a full environment, but science says otherwise. Causes our senses to work overtime on stimuli that aren’t necessary or important. Distracts us by drawing our attention away from what our focus should be on. At one end of the minimalist spectrum, we read about people who’ve sold nearly everything they own and live in a tiny home or on a boat or in a motorhome. I’m not sure I can see myself going to that end of the spectrum, but there definitely is an appeal to clearing out things so I can savor the things I really love. Even if you choose to not adopt minimalism, you still can make life better by addressing the physical clutter and simplifying your life. You can take small steps. There are ways to overcome clutter. We’ve discussed this before in episodes 14 (Conquering Clutter), 16 (Conquering Clutter, Step by Step), 37 (A Quick and Dirty Look at Clutter), and 83 (The Art of Decluttering: An International Conversation), so I’m not going into depth here, but we just want to consider if our energy would be better used elsewhere and on things that really matter to us. Think about that now and let’s talk about managing and reducing physical and mental clutter. Physical clutter can take on many forms, such as paper, kids’ toys, clothes, mementos (TPW 105), knick-knacks, kitchenware, etc. Our first instinct is to find ways to organize it and that can help, but a better option is to weed it out first. If you’ve done that and want help in getting the things you’ve kept in a better order, check out Lisa Woodruff’s Organize365 website and podcast. She has a ton of resources that can help. We can address mental clutter by focusing on one project at a time, without distractions. We can turn off mobile devices, outside sounds, etc. Practice — just focus on on that one project for a period of time. Many of us can’t do this all day long, but we can set aside some time each day where we turn off the digital noise and focus on getting our most important work done. I encourage you to read Tina's article for more information on her approach. Can we simplify our lives? I think it's possible, but it requires awareness, intention, and purposeful thought and action. It’s not about getting rid of everything, but simply making small changes to our space, our thinking, and our habits to make our life more peaceful and more in control. Declare a buying fast — commit to not buying anything new for a period of time. Find one thing each day to trash or donate. 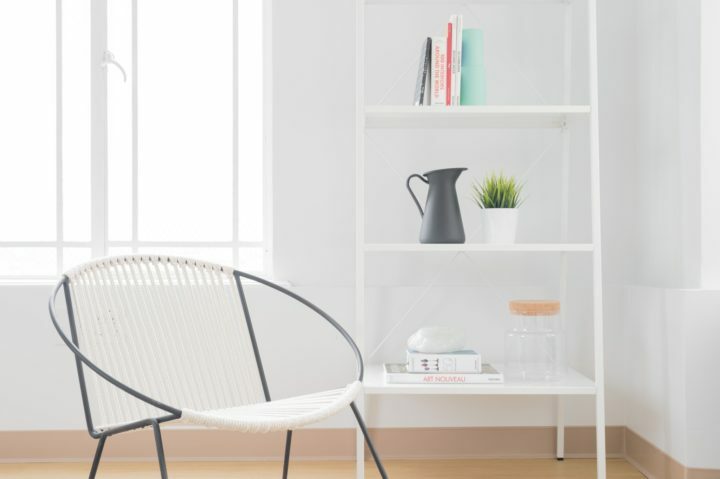 Choose one room, or one corner of a room, to declutter and tidy and create a place where you can get relief from the busyness and clutter; relax and breathe. Establish “unwired” times — no Facebook, Instagram, or text messages. Allow your brain time to be quiet. As Joshua Becker has said, “A steady flow of distractions from other people may make us feel important, needed, or wanted, but feeling important and accomplishing importance are completely different things” (“The 10 Most Important Things to Simplify in Your Life”). Simplify your schedule by being more thoughtful and intentional about activities and what you say yes to. Remember– anytime we say yes to one thing, we say no to something else. What are the benefits of simplicity? Makes space for calm and clarity. Can improve our health, offering, for example, improved brain function from less screen time and better, more restful sleep. As we're moving toward the end of the year, giving thought to managing the clutter in our homes, offices, and minds can reap results. By spending a little time simplifying, we can make our lives calmer, more peaceful, and more productive. Have you felt any of the effects of clutter that we talked about? What steps have you taken, or will you take, to get relief? Thank you to our sponsors, Sanebox: Click on my exclusive link and you’ll automatically have a $20 credit applied to your account on top of your 14-day free trial. If you’re looking for compassionate, supportive, honest help in evaluating your situation, identifying where you could make changes, and creating a path forward, I’d love to help. Check out the Work with Me page for information about TPW mastermind groups or private productivity coaching. New mastermind groups will start right after the first of the year, but I’m taking applications now. I have a couple of spots open for one-on-one coaching.